The Brussels region is home to 180 nationalities, with 108 different languages spoken, and more than 55% of residents were not born Belgian. These are some of the findings from a newly published report - the third edition of a major research project by the Brussels regional government and tourism agency Visit Brussels - which updates the previous stats from 2009 and 2011. "The European and international institutions have made a significant impact on Brussels and have transformed the city from a national capital into the polyglot, international city that it is today," says Alain Hutchinson, the Brussels commissioner for Europe and international organisations. The study found that public-sector international organisations - from the European Commission and Nato to the European Space Agency - are responsible for 121,000 jobs or 16.7% of all employment in the Brussels region. 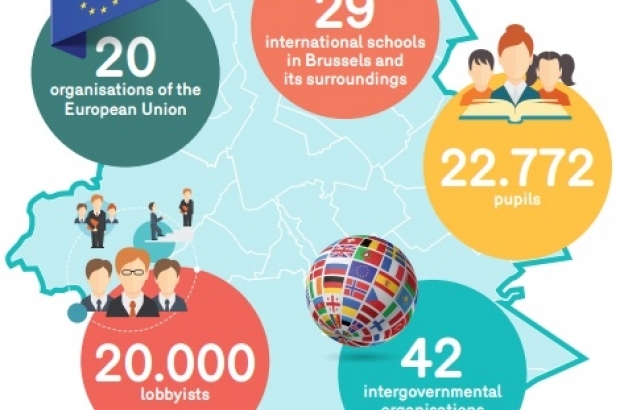 Here are some more facts and figures about international Brussels from the report. Etterbeek has the highest concentration of non-Belgian EU citizens in the Brussels region. Ixelles is close behind on 34.4%, then Saint-Gilles (28.7%) and the two Woluwés.